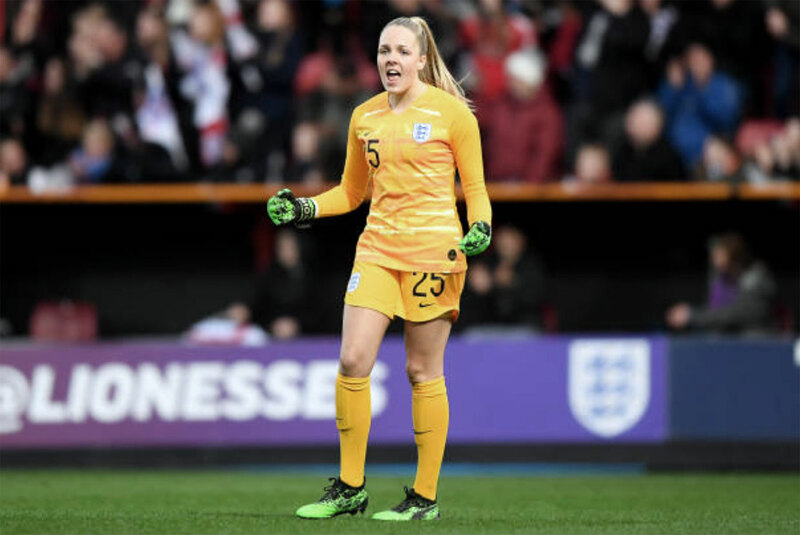 Nineteen-year-old Manchester City goalkeeper Ellie Roebuck made her first senior start for England against Spain in the Lionesses’ 2–1 win on Tuesday night in just her second appearance for the team. Roebuck kept a clean sheet in the 45 minutes she played before being replaced by Mary Earps at halftime. Roebuck herself said she was “buzzing” when she found out she’d be playing on Monday evening, but admitted there were a few nerves around ahead of her first start in a senior England shirt. There were no real signs of Roebuck’s pre-match nerves during a composed 45 minutes. An early corner was punched high in the air and probably not as far out of the penalty area as she would have hoped, but bar that, it would be difficult to pick faults in her performance. Coming off at the break with her clean sheet in tact, added to her minutes against Austria, Roebuck is yet to concede in an England first-team game. “We had a few corners against us and gave a few free kicks away,which obviously we didn’t want to do, but we did well, we set up well, and the back four in front of me were really solid and that really helped. It helped me become more composed and it was great from them. Roebuck admitted she knew she would only play 45 minutes after Neville told both her and Mary Earps they’d play a half each with Carly Telford missing the game due to concussion. England only managed 37 percent possession against a Spain side more than famed for its comfort on the ball but Roebuck feels her side did a good job of showing their own strengths as goals from Beth Mead and Ellen White sealed the win. “We know Spain are a good possession side and we knew we might have to go long the first fifteen minutes but we managed the game well and we came away with a result. The 19-year-old also had her family in the stadium for her first start, though it was a close run thing for her dad, who attends almost every game Roebuck plays in, after only finding out she’d be playing 24 hours before the match.